This item is an online promotion and not displayed in the store at this time. All of our products are sold exactly as described and sold with money back guaranty. Please note that the order time is 6-10 business days from the invoice date for either pick up in the store or for delivery if requested for a fee. Availability is a subject to change. 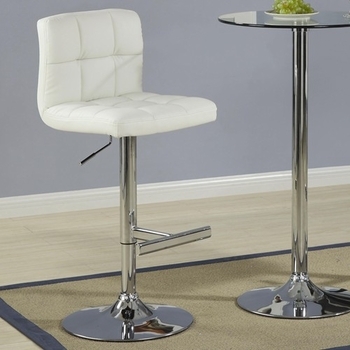 Add this simple, modern bar stool to your pub table or bar for a distinct contemporary style. 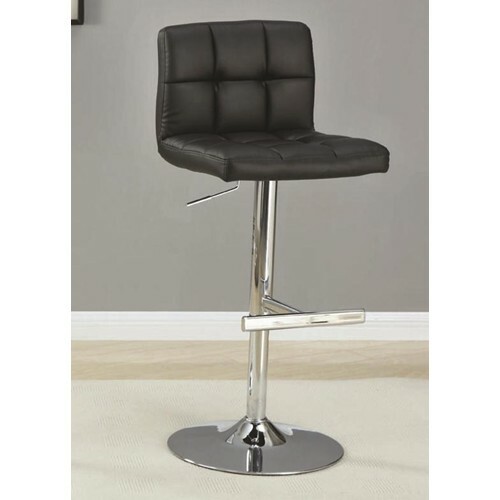 Seat cushion and backrest are upholstered in a black, durable leather-like vinyl for long-lasting appeal. Underneath the seat is a lever, allowing chair to extend height to 41.5" for easy, individualized comfort. A thick metal pedestal and base with footrest finished in a high-polished chrome complete this barstool, promising long-lasting support and durability.